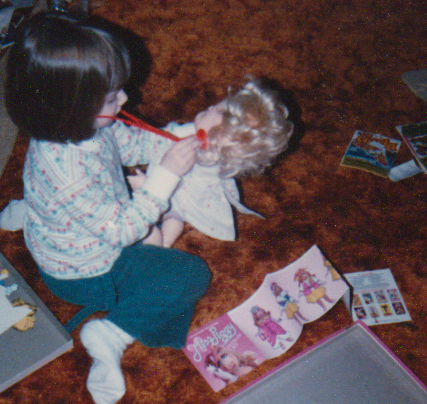 Yep, that's me on my 3rd birthday taking good care of my doll. Three years later I ended up being hospitalized overnight for croup. Basically it's a respiratory issue that creates a barking cough due to swelling around the vocal chords. It caused me to cough so much I could barely breathe. Scary stuff for a little kid. The nurse that took care of me that night was one of the kindest, friendliest people I have ever met in my life. She made me feel less afraid of what was going on with me. I knew for sure, then and there, that I wanted to be able to do that for others when I grew up. Over the years I sometimes thought maybe I would rather be a doctor, but I kept coming back to nursing. After high school I started nursing school but ended up dropping out. False start #1. Due to personal reasons I was not ready for college right out of high school. I worked for a year, moved, and went back to school for business to get myself from waiting tables into secretarial work. I temped for years and ended up in a great engineering firm. I'd pretty much given up on becoming a nurse by then. As luck would have it I became a mom and after I was home with my babies for a couple years I had the opportunity to go back to college. I jumped on it! Thirty years after the picture above I actually became a nurse! I had a really hard time finding work. I had no medical experience since I didn't work while in college as a CNA or anything. If I could do it again I might consider doing that, but maybe not. Nursing school was hard enough with a husband and kids. Having a job would have stressed me out too much I think. I had been in touch with the HR manager of the local hospice since I graduated in January, 2011 and I'd applied to be a substitute school nurse once I was licensed, but like any state or federal position that process took FOREVER. The hospice thing turned into an opportunity in February, 2012 but a month in I was so incredibly sad and depressed I had to leave. 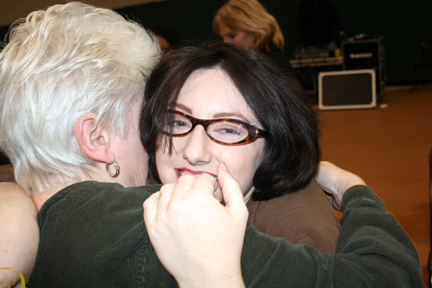 I loved the job, really, but the grief of the loved ones of my patients was too much for me to bear. I brought that home with me and it was making me and my family miserable. False start #2. 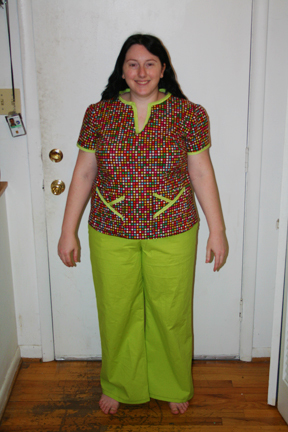 I totally sewed cute scrubs for that job! I was the brightest hospice nurse in the place. Ha! The tops had 6 pockets! Loved that! And they were 100% cotton! So comfy! And the pants generally fit, they were just a little too wide in the legs. They had pockets, too. The substitute school teacher gig was finally coming through right around the time I left hospice. The timing was rather serendipitous. I interviewed, it went well, and I was due to come in to sign paperwork to start as soon as they got it drawn up. That was supposed to take a week and it took a month! Ugh! Well, during that month another opportunity came up. A brand spanking new New Grad RN ICU Internship at my local hospital. I loved my ICU clinical rotations in college. Every time I walked into an ICU I felt like I had come home. So, I interviewed, that went well, and I was picked to be one of 6 new grad RN's to be in the program. I was so happy! I had to tell the county that I wasn't going to do substitute school nursing, though, which I was kind of happy about. I really didn't want to be a school nurse at all, I just needed some kind of experience. I started the internship in April 2012 and finished it in early August 2012. It was 16 weeks of crazy. Classroom instruction, check offs, and working with a preceptor. It was a lot to learn and do, but I loved it. I was so happy to be done, though, and kind of on my own. The nurses are all a team there so really I was never fully alone. They had my back anytime I needed them. I was on my own for about a month when I had the worst luck ever! On August 31, 2012 I fell at the grocery store (totally not the store's fault) because I was wearing really cute, but impractical shoes that were not stable on my feet. I ended up having incomplete fractures of my mid-foot bones. I couldn't bear weight so I couldn't work! Well, 3 weeks of not working and my boss (who I loved working for) had to terminate me. I wasn't covered by FMLA because I had been employed only 5 months. My boss did tell me that she wanted me back as soon as I was ready to work again. False start #3. Five and a half long months of constant pain and not being able to do basic things passed. Basic things like grocery shopping because my foot would have so much pain after that I couldn't walk for the next two days. Every time it rained or snowed I couldn't walk due to pain. I went completely bonkers. I am way too active to be that debilitated and still cope. I went through 3 specialists before I found the one for me. He's a hand and foot surgeon at Georgetown. He's AMAZING! Well, he got me all checked over, had me get a new MRI and diagnosed me with mid-foot arthritis due to the injury in August. Chronic condition. Just great. So now what do I do? Will I ever work again? I actually asked him those things. He suggested I try carbon fiber foot plates in my shoes to make them more rigid. I've been using them for a week and a half now and I haven't had pain in my injury site for 5 days! I wear the plates in shoes under the insoles. Now I own shoes that have removable insoles to accommodate the plates. So, with the right equipment I can function pretty close to normal again. Things are looking up! I emailed my former boss and requested to meet with her. She accepted gladly (a very good sign) and today I went to see her for a few minutes. We talked and she still wants me back, even almost 6 months later! She has to check out the budget to see what she can do to get me back. I'm very happy! I should hear something in a week or two. More than likely I'll have to do telemetry, and wait for an ICU opening, but I'm totally fine with that. I had to float and do telemetry nursing during my internship and when I was on my own before. I'm crossing my fingers that this can be a real start and not another false start. Good luck! You've been on quite a journey. Sending hugs and wishes. JUST KEEP SWIMMING! Thank you Heather! *hugs* to you, too! I don't own a white flag to wave, so I'll just keep trying until I get it right. What a hair-raising story! Wishing you a complete recovery and best of luck this time around: you've done so well to qualify at a very busy time in your life and you'll be an ideal nurse having chosen the profession for the right reasons. You'll also have the know-how to make the best scrubs! Thank you Marianna! 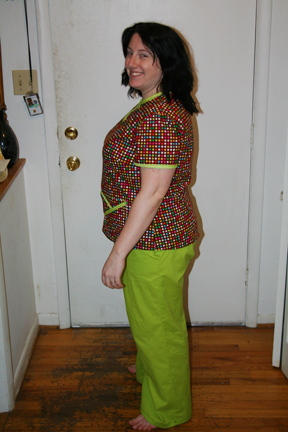 I have some purchased scrubs (I have to wear navy blue ones for the hospital job) that I love the fit of. I'm going to use them to make a pattern one day. 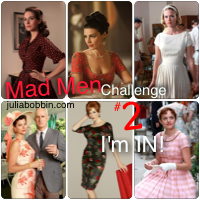 Mad Men Challenge 2 - I'm In!